Over the years I have developed an occasional hankering for the more obscure end of the vast metal scene, one supposes it is Dark or Black Metal, frankly I don’t care, I just like the portentousness of it all when the mood suits. Any band connected to Toby Driver hits the spot it seems, and the more experimental end of Mike Patton’s ceaseless outpourings – is that even within “metal”? – and purveyors of said doom and gloom don’t get much darker than denizens of Scandinavia, such as the fabulous and frankly uncategorisable Ulver. And so we arrive at the catchily monikered New Keepers Of The Water Towers, who hail from Stockholm, and whom to my untrained ears might fit into some daft niche of obscure metal, maybe? Infernal Machine is the band’s fourth album and opening doom-laden epic The Forever War takes a leaf or two from the modern Kayo Dot user manual, building atmosphere in layer upon layer of crashing funereal-paced black majesty over which treated vocals bemoan the dystopian place the protagonist finds himself trapped in. Quite a promising start. The band soon establish their own sound, and the instrumental Tracks Over Carcosa marches along to a synth-driven pulsebeat, soundtracking a sci-fi chase sequence through an asteroid belt. In fact apart from the opening track, only two others have vocals (no Cookie Monsters, thankfully) with the result that the instrumental aspect of the band is by far the most important. New Keepers’ brand of Kosmische Rock is heavily reliant on driving rhythms supplied both by the drums and synths, on top of which overdriven guitars flail away to their hearts’ content. The album is a concept based on the militaristic sci-fi novel from which the opening track gets its title, and as you’d expect the sound is BIG and crushes all in its path. The shuddering zombie monster footfall rhythm of the opening track returns with a vengeance on the thoroughly nasty Jorden, and we build to a thunderous climax with closing track This Infernal Machine, in places borrowing an atmosphere first beaten on the anvil of the track Black Sabbath, showing that you can’t keep a good idea down, even nearly 50 years later! 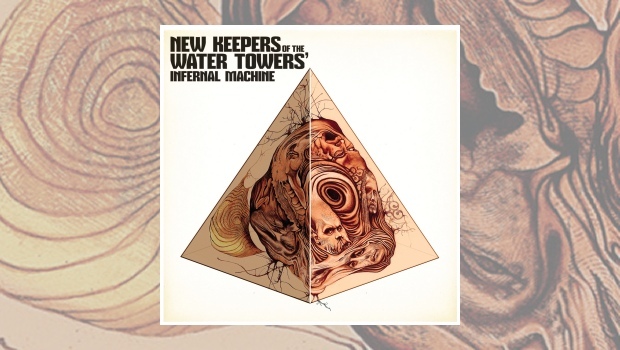 There are no boundaries being pushed here, but New Keepers Of The Water Towers have made an enjoyable and darkly cinematic record that lives somewhere in a place where black metal and spacerock meet. I would imagine is a blast seen live.